One of the biggest challenges these days (as always) is Content. There are lots of questions that help you put it together – Is this top of mind? Does the listener actually care about it? Do you have anything to offer on this subject that’s unique, and not just what everyone else will do? Where are you going with it? Is there a chance that it could lead to listener feedback, or is just a one-off thing? …etc. But these leave out what I consider to be the most logical question to ask yourself: Is this something you’d say at a barbecue, to a person you just met? If not, why are you saying it? This will not only quickly cut to the chase as to whether it’s valid Content or not, it will also (hopefully) shape the LANGUAGE that you use, how you get to it, how you edit it, and most importantly, keep you from sounding like a disc jockey and more like a real person. No one is enjoying hearing people read crap off a computer screen or someone’s stupid Facebook post on the air. Dig deeper if you want to be great. Then I worked for radio pioneer Gordon McLendon (who, with Todd Storz, INVENTED Top 40). Gordon was all about Creativity too, and P. D. Michael Spears taught me tight, concise formatics to harness that creativity. Others followed: the great Lee Abrams, who infused “Stationality” to a stunning degree, and made me realize that TRYING to be funny was the wrong path; being yourself (and therefore unique) was far more important. Bill Young in Houston, who rarely said anything, but when he did, it was like gold coins dropping into your hands. Jack McCoy, creator of the best contest ever, “The Last Contest” at KCBQ in San Diego. 1. Today’s show should be about TODAY as much as possible. Recycling old material usually sounds like just that, recycled, calculated. Some days are “drier” than others, but Wednesday’s show can’t just be a repeat of Tuesday’s show. In this era of voice-trackers reading crap off a computer screen, or taking “click bait” stories from the internet or social media, there’s a lot of nothing being said. 2. RELEVANCE is the key. If it doesn’t matter to the listener, you’re just “a voice saying words” – a dull, droning noise to be tolerated (maybe), but not really connecting with the listener in any meaningful way. If you’ll sift everything through those two thoughts, I guarantee that you’ll get better, no matter what your level of experience is. We ALL had mentors. If you’re not still learning, you’re regressing. Truly great air talents know this, and it’s a really interesting parameter to work on as a coach. But the key is IF you can figure out exactly what the “fuse” is to light that “nugget” up. Often, I see air talents with a good concept, but no idea of how it might work. Using something just because you have that bullet in the chamber doesn’t mean that you can just fire it indiscriminately. If you have a dog, you know this to be true: most dogs lie around waiting for something to happen, then – and usually ONLY then – they get up off their duffs and JOIN you. Dogs are eager to participate, but they’re not usually self-starters. 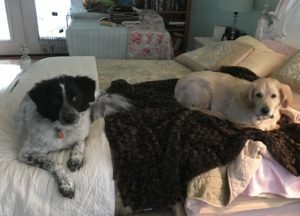 My best friend’s two dogs lie around on the bed until one of us goes into the kitchen, or outside, then they LEAP off the bed, ready to join in on the sandwich I’m making, or if I go outside, run out the door with me to do whatever they think I want to do (which apparently is bark at squirrels). Waiting for something to happen, then joining in. That describes a lot of air talents today, content to just do the basics, promote something, say some nebulous “glad to be a part of your day” language, then go back to looking at their Facebook pages while the song plays. But that’s how dogs live. Pick a subject, think up an angle on it that’s personally revealing and entertaining, then open the mic and DO SOMETHING. A talent who’s just spewing out the artist’s name and the song title, or doing some generic liner, is pretty much just a waste of time. Honestly, I’d rather you just play the sound effect of a dog barking. That would be more entertaining. As we continue to hear the buzz word “stories”, it seems to me that people are talking more, but not necessarily being all that interesting. Every movie is edited. Every book is edited (usually multiple times). Highlights are watched more than actual games. Top 10 lists are the vogue, not Top 100 lists. Stand-up comics start with a good 10 minutes, not a 90-minute HBO special. The cardinal sin in radio is wasting people’s time. And from a coaching standpoint, believe this: if you can’t do a short break, you can’t do a long break. Most people tend to wander around, stagger into “related” thoughts that can easily take us off the main road into the forest somewhere, and instead of taking the First Exit – the first place where there’s a “reveal” of some sort or where the subject resolves – they keep trying to top themselves or fire more bullets into a dead body.